That’s funny. 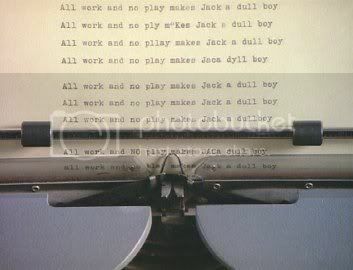 last week, I was rudely interupted at work, while I was typing out a post that said “All work and no play makes Blair a dull boy”, written about 20 times. I didn’t post it because I ran out of time. Then I went on vacation, and when I got back, I was going to post it, but it just didn’t work following a vacation post. Why wouldn’t you type it once, hit ctrl-c(copy), then ctrl-v(paste) 19 times? Probably because you are getting paid by the hour. Mike is correct. And it’s just easier to type it out, because I was the “Halton Keyboard champion” in grade 10, and I like to practice my craft of typing and relive the glory days! Oh yeah. And I was going crazy, and I thought I was actually typing out war and peace. how about a new thread about this news?